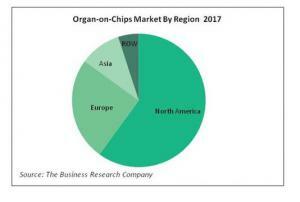 LONDON, GREATER LONDON, UK, September 26, 2018 /EINPresswire.com/ — The market for organs-on-chips (OOCs), the cell culture chips that imitate the activities, mechanisms and responses of body organs, will be worth $284 million by 2022, according to interviews with industry leaders from The Business Research Company (TBRC) in its report Organ-On-Chip Global Market Opportunities And Strategies To 2021. The market's growth is expected to accelerate going forward. The OOC market is still in the development phase but some commercialized products have established markets. The lung-on-chip market is currently the largest segment, followed by the heart-on-chip market, the liver-on-chip market, the intestine-on-chip market, the kidney-on-chip market, the skin-on-chip market, and the blood-brain barrier-on-chip market. North America, particularly the USA, is the largest market for organs-on-chips, followed by Europe. These are the regions where most drug development is currently undertaken. However, Asia and the rest of the world will also see significant growth in the market up to 20212. Since the organ-on-chip market is still in the research and development phase, and has not been completely commercialized, it is dependent on government grants. For example, in 2012 the USA’s National Institutes of Health (NIH) established a ‘Tissue Chip for Drug Screening’ initiative. The establishment of this program was aided by NIH's Common Fund and the National Institute of Neurological Disorders and Stroke. NIH plans to commit up to $70 million over five years for the program. In total, 15 NIH institutes and centers are assisting in the coordination of this program. Seventeen research projects were awarded about $13 million in July 2012. In 2014, NIH began the second phase of funding for the Tissue Chip for Drug Screening Program in which 11 institutes were supported by $17 million. In September 2017, NIH funded 13 institutions. The funds allocated were close to $15 million.